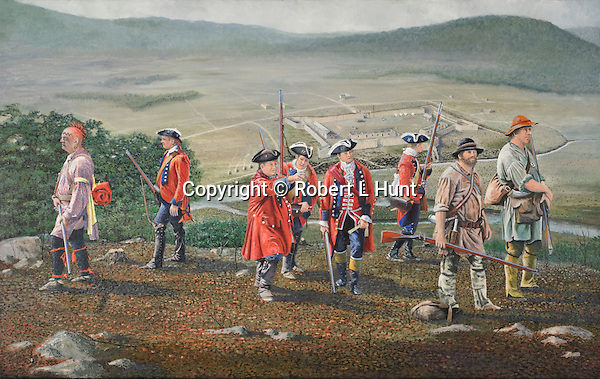 During the French and Indian War, the British Army built a string of garrisoned forts into the frontier from the edge of civilization in the East into the wilderness of western Pennsylvania. They were connected by the first road built through that wilderness which become known as Forbes Road, the name of the overall British commander, General John Forbes. It is now present day US 30. These forts were to allow a large British Army to easily move westward to dislodge the French at the confluence of the three rivers: Fort Dusquesne, present day Pittsburgh. Protection from possible attack by the French and their Indian allies was important during the building of Fort Bedford in the early stages of the operation. In this painting, Colonel Bouquet (pointing) and his scouting party are assessing the nearby terrain for the best sentry positions. He is accompanied by an Indian allied with the British, Chief Kissity, (wearing yellow armband to show his British allegiance), other redcoat officers and men, and local Indian traders John Fraser and James Dunning (far right). Oil on canvas, 22"x 34".